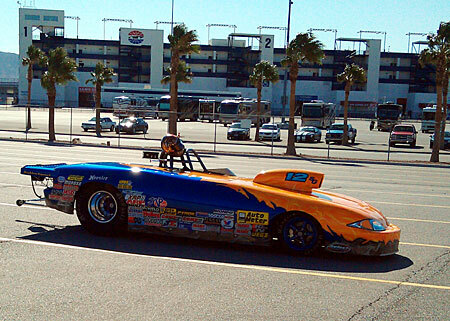 After another good night's rest it was time to finally hit the track here in Vegas. The morning kind of started with an adventure with my car not wanting to start and act like it was flooded over. Didn't take long to figure out the culprit was the towel we put in the scoop yesterday to keep the dust and dirt out with all the wind. Oops. We like simple fixes, though. The wind had died down to only 6-11 MPH for our runs today, which was a welcome relief after yesterday. The first hit is always an adventure here, with the 10.05 index, so usually if you're within a tenth or so either way, it's a good start. 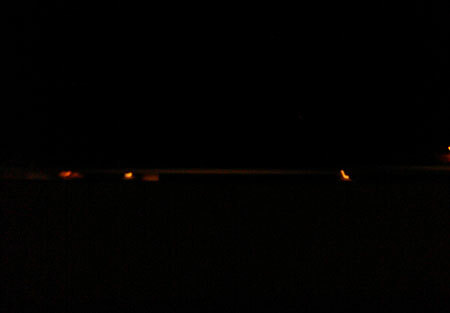 I looked through my logbook from 2009, the last time we were out here, to try and get some delay settings. The last time I was here, my best hits on the tree were -.025, -.023, and -.022 pure, so I put .025 in the box as a starting point. 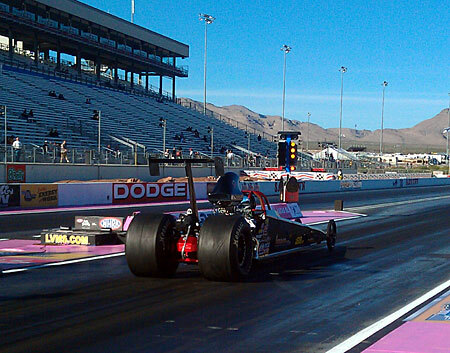 After a friendly West Coast welcome from Justin Lamb in the staging lanes, we squared off on the first time run. 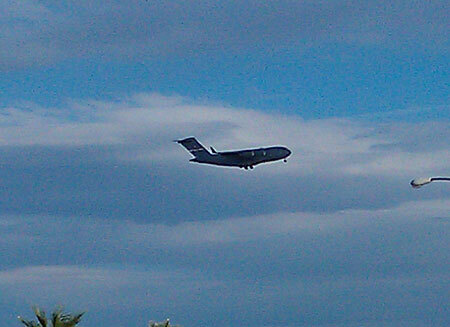 The rollout must be pretty close to where it was the last time I was here, as I was .002 on the tree. 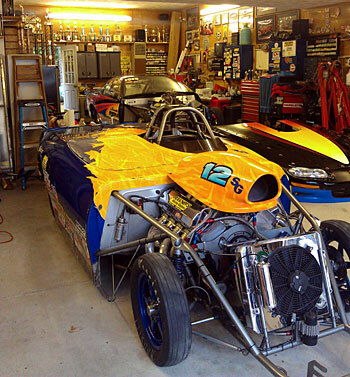 and ran just a little quick at 9.94 at 165 MPH, about 4 MPH slower than the last race at Maple Grove in the mineshaft air. Dad's car went the other way and was a little on the slow side at 10.13 @ 165 with an .015 tree. We came back and looked at the data from both cars to see if we wanted to make any changes. I was happy with the way both cars looked on the graphs, the air/fuel ratios were a little on the rich side, but not enough to warrant changing jets. Maybe if it was going to be 100 degrees out, but it's only supposed to get to the low 80's for the weekend. The second run, we got a bit closer, swapping from right lane to the left with me being .011 on the tree missing it a little bit, and 10.034 @ 164 on the stripe, trying to run 10.045 and picking up .008 in 60'. 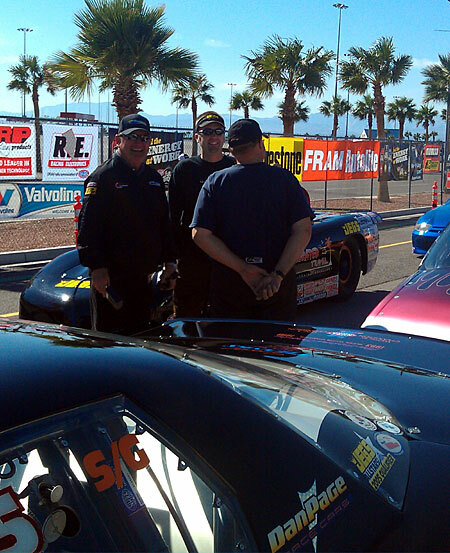 Dad's car lost .009 and 60', running 10.070 at 165, after a -.002 red start, which we were happy to see. After the second run, Mom finally got here to the track after a long day of traveling to kick off her vacation, and around the same time Samantha Kenny.. err.. Coughlin, and the CEO of Accelerated Travel, Jackie Fricke showed up to add a little sunshine to the day. Also swinging by were Marc Erickson from Auto Meter Products checking on how things were going with our Data Recorders in both cars and our friends Scott Mackie and Kyle Fickler from Weld Wheels. We really don't get to see Scott too often these days, now that he's moved back to Michigan and is working out of Kansas City. The third run kind of snuck up quickly on us but we had Dad's car dialed in pretty good as he finished the day off with a dead-on 10.054. My car must've caught a gust of wind going down as it slowed to a 10.088. It gave the 60 foot back, so it probably only should've been a 10.065 anyway, but it was down about .75 MPH, which I'm just chalking up to the wind. Ray in the lanes for Q2 behind our friend Craig Anderson. 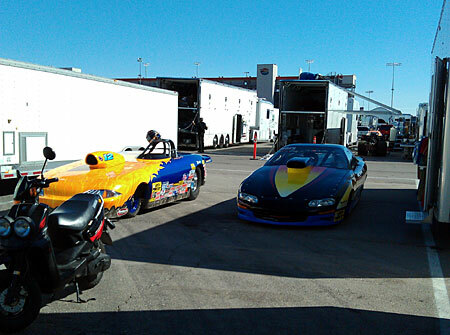 Ray chatting it up with Gregg Odom and Jason Kenny in the staging lanes. 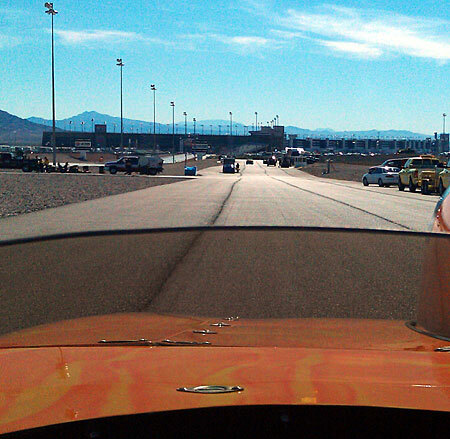 The view rolling down the return road after making the top end corner. Jason Kenny launching on his second time trial in Super Comp. 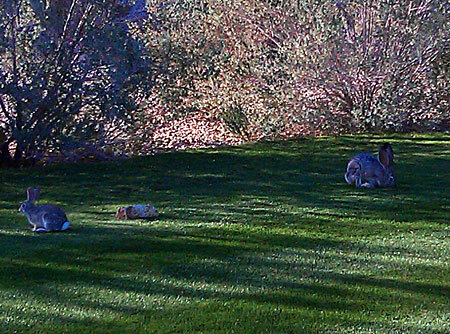 So we spent Monday pretty much doing nothing, recovering from the drive out here. We slept good Sunday night for sure, I'll tell you. When we got to the track, there wasn't any signs or anything directing you where to go so we took a chance and drove down next to the circle track where we've been stacked before and sure enough that's where everyone was. Althought it's not like back home in Division One where you show up for a race and they give you a number and stack you. There was no track personnel there to tell you where to go, or have any semblance of order. Having been through this drill before, we found a few spots for the three rigs not too far from the entrance and where we wouldn't be blocked in. The speculation of the day Monday was when they were going to allow us to move up by the dirt track to actually stack in lines to be parked. The last time where were here they did it Tuesday, so we figured we'd better be ready in the morning for the mass free-for-all that is the exodus up to the dirt track. Well, nobody from the track came down for us so a few racers called the track, which said that we weren't parking until Wednesday. At that point Al Kenny and I decided to hit the golf course to kill some time. 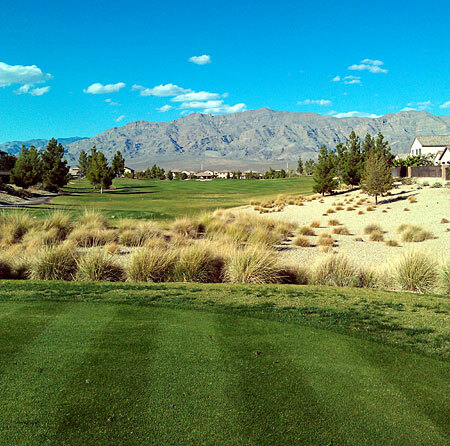 We went over to Aliante Golf Club in North Las Vegas, and I'm glad we did. We teed off at about 12:20, it was $45 with a cart, got country club type service, the course was in great shape, the weather was beautiful. Couldn't ask for much better. Once we got back to the track and cleaned up, The Kennys, Phil Monteith, Ryan Herem, Dad and I all loaded into the Kennys HHR like it was a clown car and and headed over to Buffalo Wild Wings on Craig Road. After a lot of wings, a couple wobbly pops and some good stories, it was back to the track for the night with an early morning wake up call. Wednesday morning at about 7AM on the nose, track security came over and honked their horns and rang the sirens signaling they'd finally allow us to move over to the dirt track to stack. I don't think too many people traded paint in the giant fustercluck that was the big move over to stack at the dirt track. 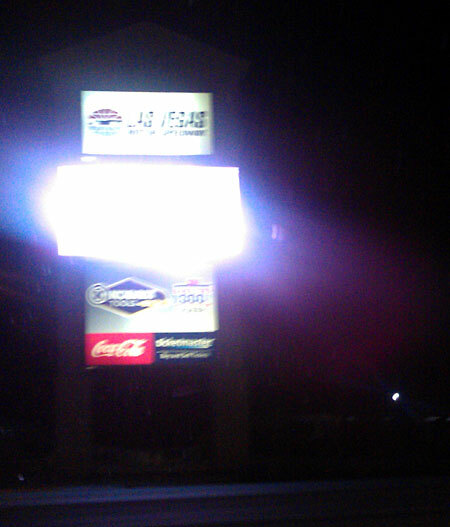 We were there for about and hour before they started bringing rigs inside the track to park. We ended up getting parked down towards the staging lane end of the pits, off the main road by a row, with Alcohol Funny Cars and Dragsters out our back door including the Massachusetts teams of Paul Gill and Fred Tigges (so we won't be the only ones with the funny accents) and the Selkirk, NY team of John Finke. 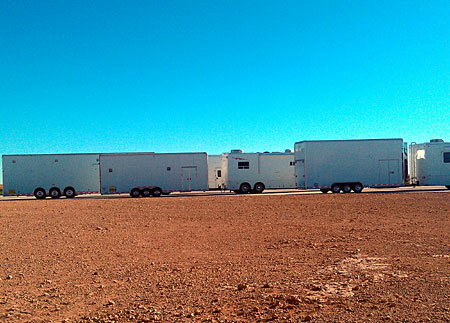 With Al and Jason Kenny's rigs next to us, we have our own little Division 1 compound. 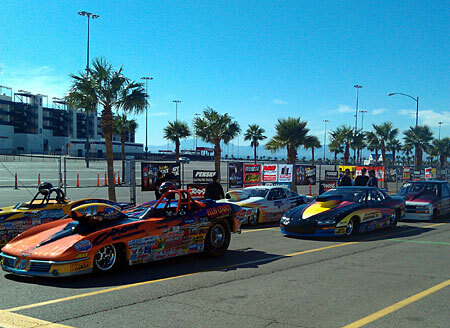 We unloaded the cars and brought them over to tech, and sailed right through since there was no line-up. We took care of our credentials and then I took my Cavalier for a little ride around the pits to seat the new brake pads in. Only problem was the pedal was terrible. The first pump you only got about 1/4 of the braking capacity with the pedal on the floor, and after a couple pumps it was fine. Not something you really want at 165 MPH. So we took the nose off to get a better look at the brakes and sure enough the rotors were warped not only in and out, but they also crowned from the hat out. And what was happening was the inboard pad had a gap between it and the rotor and the first pump was the piston pushing the pad out to meet the rotor, and after that it was fine. I went over to the Hyatt Racing Services trailer on the midway and grabbed a couple of new rotors and we put them on the car and bolted the front wheels back on. As soon as I sat down in the car and pressed the pedal, I knew it was fixed. The pedal was nice and firm and right up at the top like it used to be. A quick spin around the pits to finish seating the brakes in, a throttle stop RPM adjustment for this altitude and we loaded up for the day. Parked in the stacking area... Complete with palm trees! 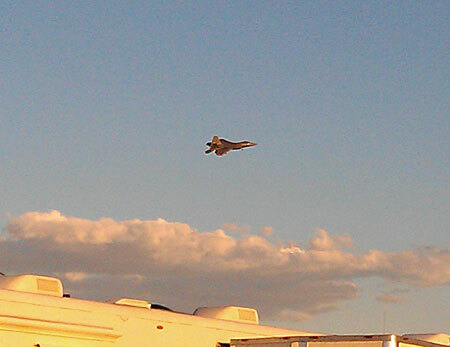 Did I mention the free airshow we get here in Vegas? One of the great views from Aliante Golf Club. 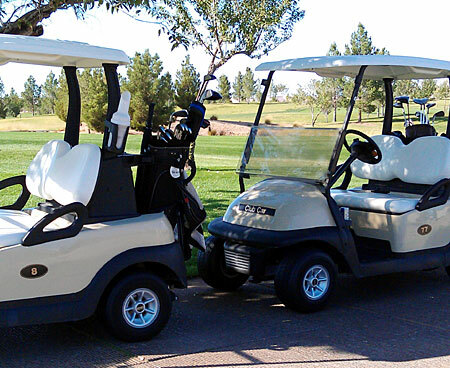 Way to make a Bruins fan feel welcome with cart numbers 8 and 77! 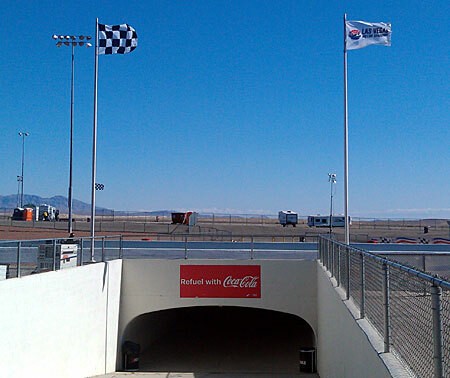 The empty pit area of The Strip at Las Vegas Motor Speedway as parking began. 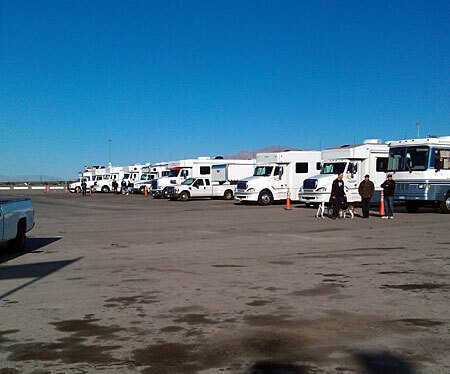 Rigs lined up waiting to get in. It was VERY windy on Wednesday. The flags at the half track tunnel were getting quite a workout. From behind the tower looking downtrack. The Cavalier at tech in the staging lanes. Replacing brake rotors on the Cavalier. 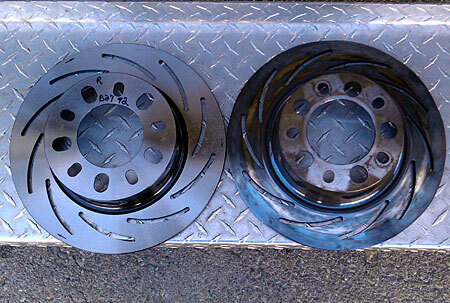 New, round rotors and 2 season old, not-so-round rotors. Taking a trip through the pits to check the brakes. 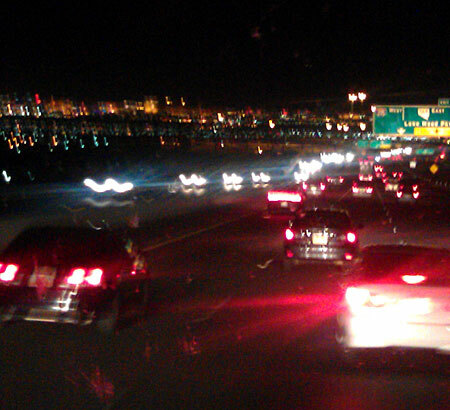 Greetings from fabulous Las Vegas Nevada! After pretty much non-stop driving since we left work on Friday, we've made it out here... and a day earlier than planned! Today's 750 miles seemed like a walk in the park after the 2160 miles the previous 39 hours. 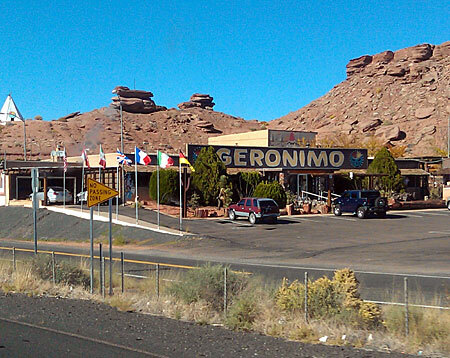 Once we hooked up with the Kennys in Tucumcari, we took a leisurely stroll over to Albuquerque, NM to fill with fuel and grab a quick bite to eat. 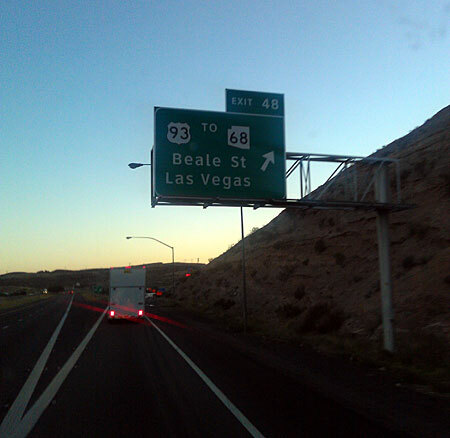 From there it was just 575 miles to Vegas. No sweat! I even managed to get an hour or so nap in, bringing my sleep total from the day before we left to now up to almost 8 hours! 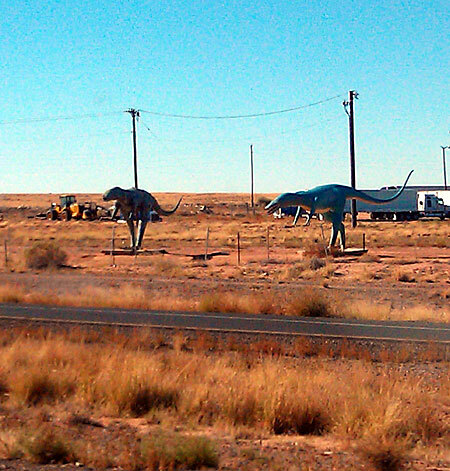 You think someone would've warned us about the damn dinosaurs crossing the desert! Where were our West Coast friends on that one? I tried 5 or 6 captions for this.. None of them fit to print.. haha. 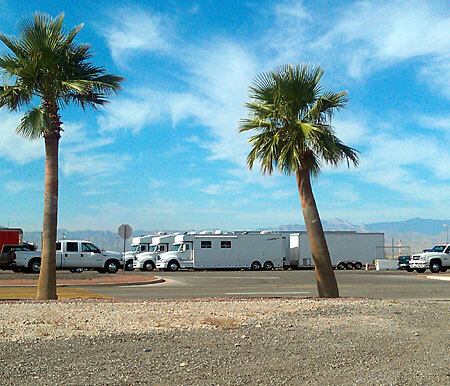 The 3 rigs in an Arizona rest area. 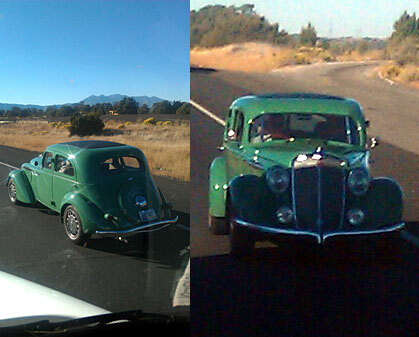 Passed this car today and have no idea what it was. Painted on the spare tire cover was "Hipmobile". Thanks. That helps. ... until we reached the top. Then it was all downhill from there. 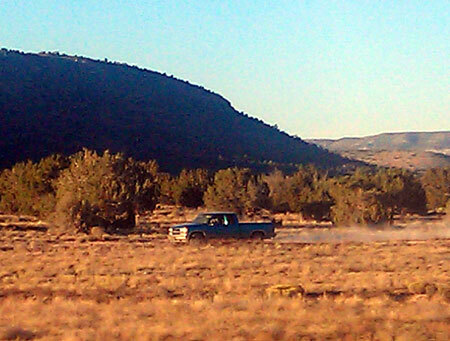 This looked like a Chevy Truck commercial straight out of 1989! 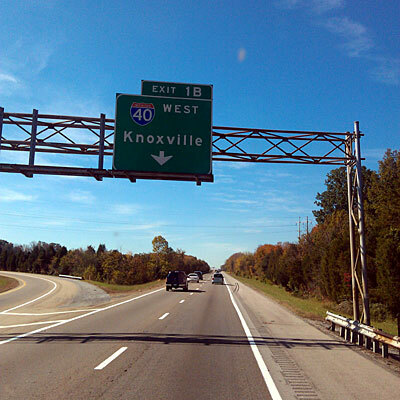 And finally getting to exit off Interstate 40! 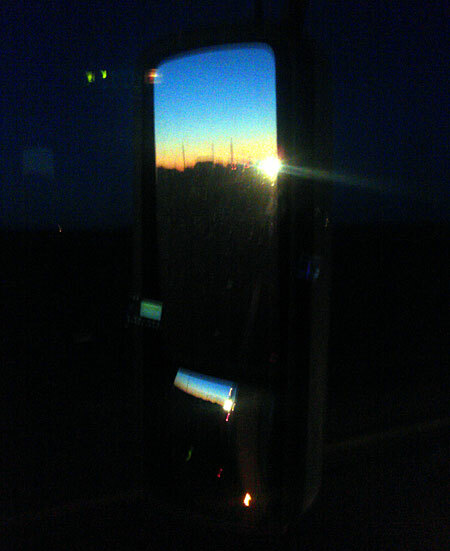 Nice reflection of today's sunset in the windows and mirror. What.. You couldn't tell this was the Hoover Dam? I can honestly say I've driven right by the Hoover Dam and still haven't seen it. Might have to take the Dam tour sometime. 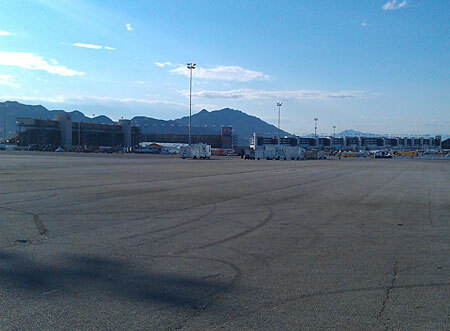 Finally, Las Vegas off in the distance! Vegas! 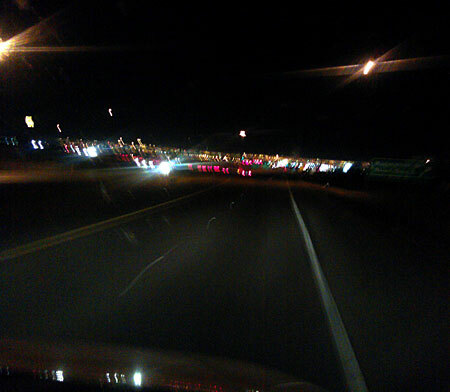 (Well, Downtown anyway off of I-515). Then off to the track! And the final total on our trip from Acton, MA to Las Vegas. Don't worry about the max speed. That was downhill on a very straight section. Yeah, that's the ticket. 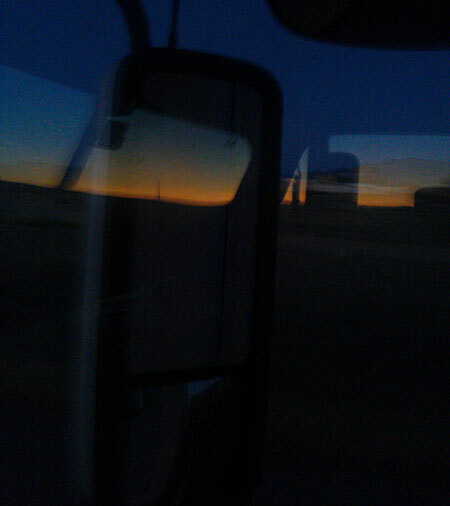 We just pulled into a Flying J Truck Stop in Tucumcari, New Mexico and shut the truck off for the first time in exactly 24 hours when we started it back in Virginia. 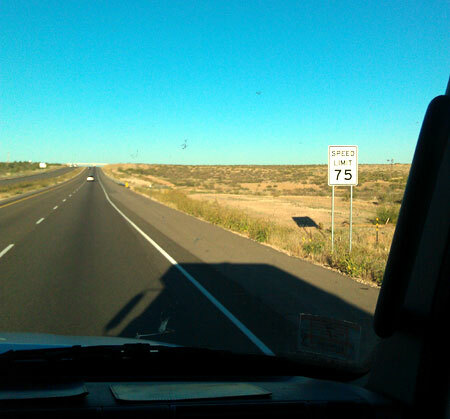 In that time span we finished off 81, and have been on 40 through Tennessee, Arkansas, Oklahoma, Texas and about 40 miles into New Mexico. 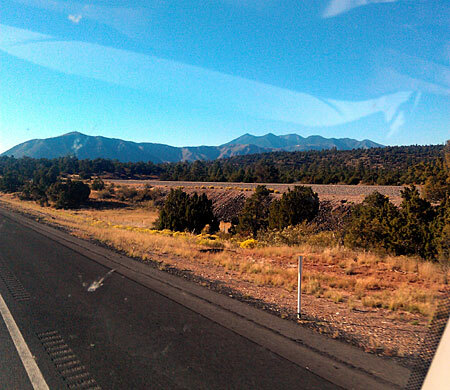 We covered a whopping 1440 miles in the last day, so even with fuel stops averaged 60 MPH. 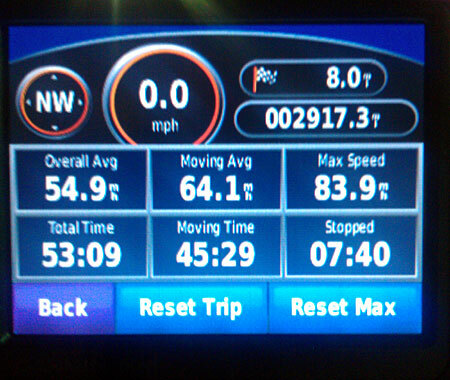 Our total distance traveled so far is 2165 miles in 39 hours, with an easy 755 miles left on the plate. 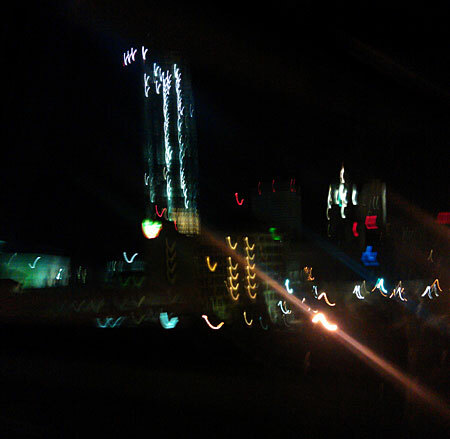 Oklahoma City at night. Probably looks a lot less squiggly during the day. 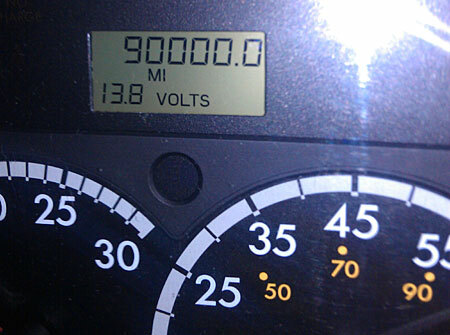 The motorhome clicked 90K yesterday, pretty much all going to and from racetracks since 2005. About 15K per year. "So you run and you run to catch up with the sun but it's sinking. 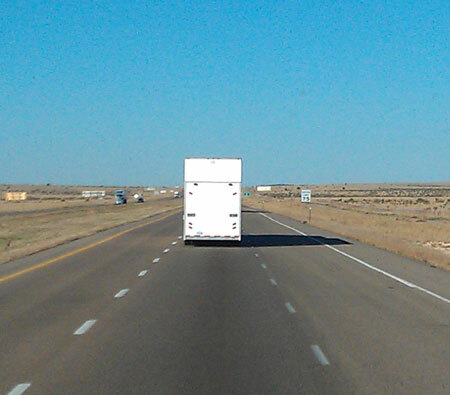 Racing around to come up behind you again." 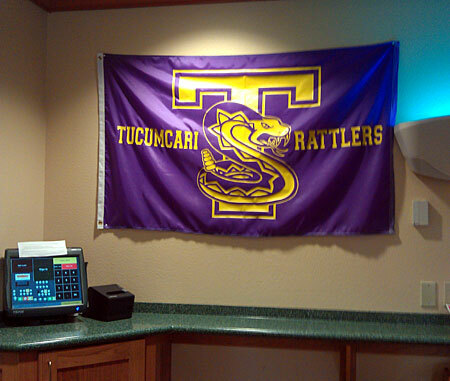 In a rest area last night I saw a sign "Watch for Snakes" so, I believe Tucumcari's Mascot is appropriate. Sure is a lot of nothing out there. At least you can get through it quickly, though. And yes, we did manage to catch up with Al and Jason Kenny this morning. 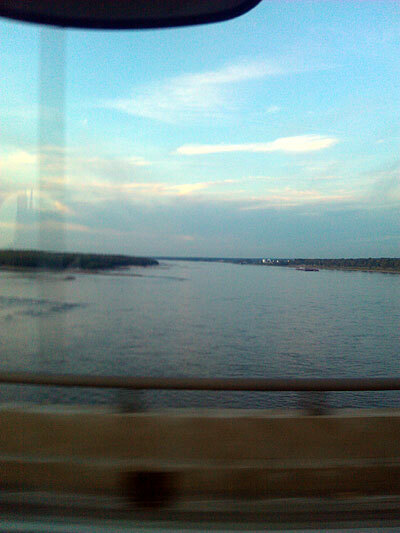 Well, we just crossed the Mississippi River going from Tennessee into Arkansas. 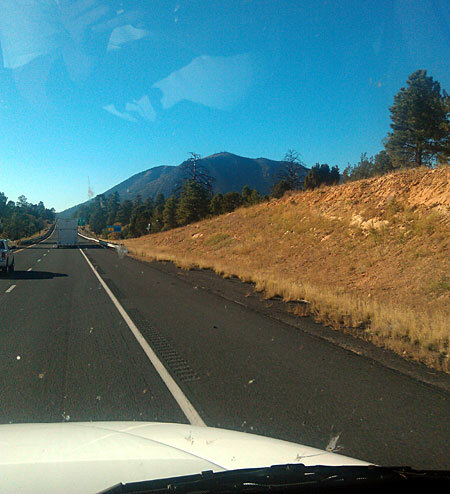 1340 Miles down, 1580 to go. The GPS is finally giving us an arrival time (it won't if it's more than 24 hours away) of 4:10PM Pacific time tomorrow if we drive straight through, but that likely won't happen. Although we will try and drive most of the night to try and catch up with the Kennys who are currently in Texas and are planning to stop in New Mexico tonight. 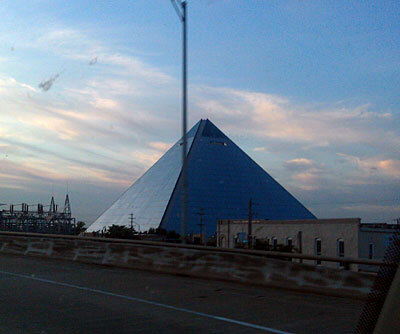 "What you want to do is take a right on I-40, then follow that for 2000 miles..."
"Wait, is that the Luxor? 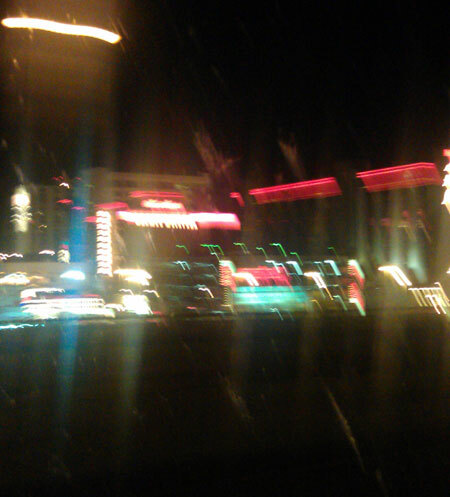 Are we in Vegas? What? Oh, Pyramid Arena in Memphis. Gotcha." "Ahh that's the Mississippi, the mighty Miss, the old miss, the old man....Deeep River..."
Great sunset.. We don't get too many of those at home. Too much in the way to see it. It's back! After a long six year hiatus, I've decided to fire back up the update machine. What's the special occasion, you ask? 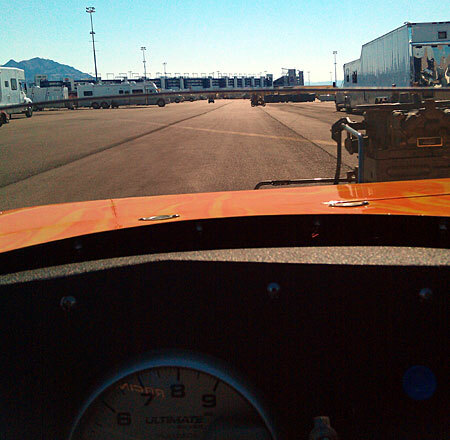 Well, after work Friday night, we put the rig in drive, turned left out of the driveway and set the GPS for The Strip at Las Vegas Motor Speedway, 2920 miles away. 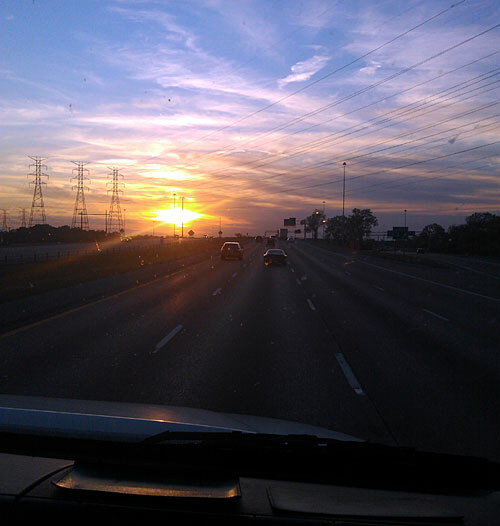 I'm writing this now as we're just about to Bristol, TN after an all night driving marathon. The route we're taking is pretty easy, going Massachusetts Turnpike to I-84 through Connecticut, New York and into Pennsylvania. We grabbed 81 near Scranton, PA and are taking that down to I-40 West in TN. Once we're on 40, it's a quick 2000 miles through Tennessee, Arkansas, Oklahoma, Texas, New Mexico and Arizona from there to 93 in Nevada. We usually like to hustle out there and then give ourselves a day or two for our bodies to recover, catch up on sleep, and adjust to Pacific Time. Our friends the Kenny Family are also making the trip, but they left their Pennsylvania shop Thursday so we're about a day behind them at this point. 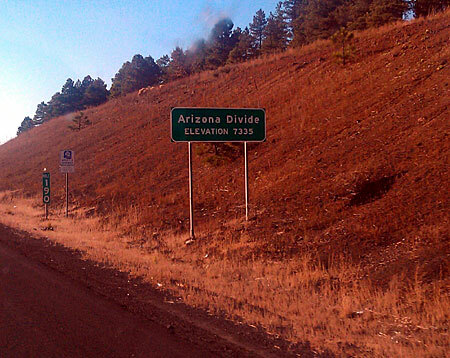 Although with two drivers, we just may track them down before we get to Vegas. A lot of people think that the reason we're going out is because I'm doing well in the points this year, and yes, that's true, but this trip was actually on our schedule to start the year. With my brother Brian and his girlfriend Stacey (and their dog Betty!) 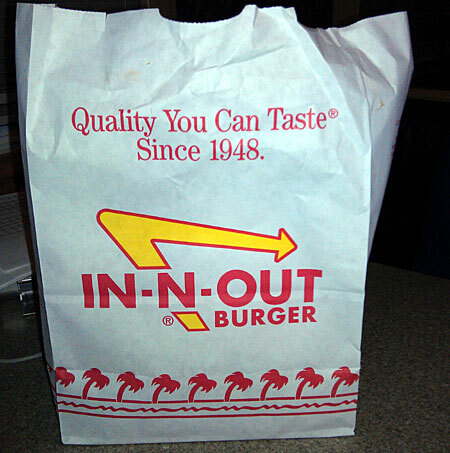 living in Los Angeles, we like to make this trip every few years to make a vacation out of it. When we plan this trip, we make the rest of our racing schedule pretty light with as many one-weekend and home trips as possible so we can spend more time at work during the year to squirrel away some money for the big trip, which we're gone for almost 4 weeks. 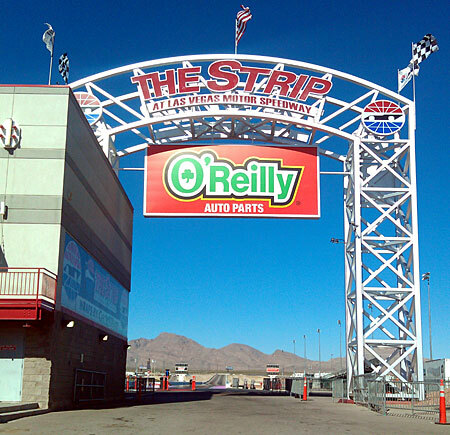 We'll be getting four races out of this trip, starting with the NHRA National event in Las Vegas, NV, following that up with a $350 to enter, $10,000 to win race Wednesday, and then the NHRA Divisional event in Las Vegas. After the Divisional, we'll make the four hour tow through the desert to Pomona, CA to run the World Finals and put a cap on the season. 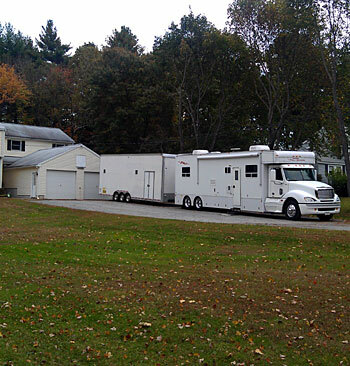 Our preparation for this trip started a couple weeks ago as soon as we got home from the sportsman version of the Keystone Nationals at Maple Grove Raceway in Pennsylvania. When we left the track, the motorhome picked up a little bit of a rough idle so when we got it home, we brought it to the local Freightliner dealer to have it looked at. $1200 later the injectors all had new o-rings and the engine was happy again. We serviced the generator so that we didn't have to be afraid to put hours on it if it was a little hot out there on the West Coast. 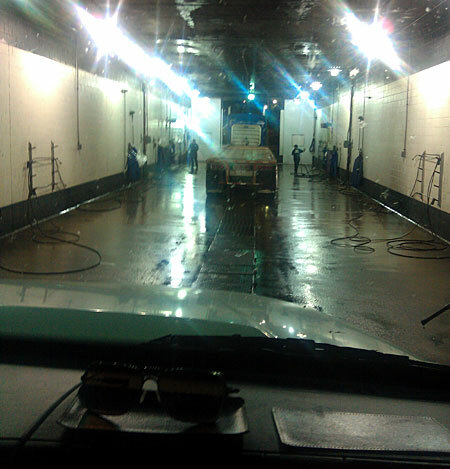 A quick trailer service of greasing the wheel bearings and checking all the tires and the rig was ready to go. 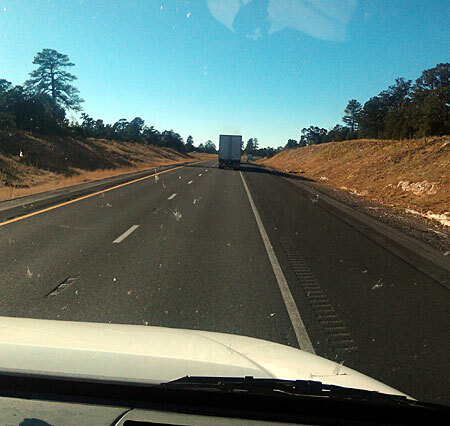 This is one of the only trips we make where we don't wash the motorhome and trailer before we go, but we will hit the Blue Beacon Truck Wash as soon as we get into Las Vegas to clean off a country's worth of road grime. We had unloaded the cars into the shop for a big service before the trip, too. Rays' Camaro got all new rocker arms after having broken four of them this year so far. In fairness the ones that were breaking did have 10 years of service, so they really didn't owe him too much. Besides the service we double checked and made sure everything in the suspension was tight and scaled the car out because of the way it was leaving at Maple Grove. He wasn't the only one having issues there, but it never hurts to check. Everything was tight and the car scaled the same as it did the last time we scaled it, so that was an easy fix. My Cavalier got a service, run through the valves, and new front brake pads. I tend to go through a couple sets of the Strange brake pads every season because of the aggressive nature of the pad material, so before we head to Pomona, CA with that very short shutdown, I thought it would be better to throw some pads in it. The rotors have the typical stop sign-like warping but no cracking, so those will get replaced this winter as it doesn't affect the way it stops. After that we loaded everything up and packed enough to get through the almost 4 weeks away. I'm pretty sure you couldn't put a piece of paper in the trailer at this point. We actually have to take the fold-out step off and store it, to get everything in there. I'm going to try and keep this updated as we go down the road, more in a blog style than in the past, so the newest entries will be at the top. Some entries might just be a couple of photos of things and places on the road, some more lengthy, especially when we get into the racing part of it. 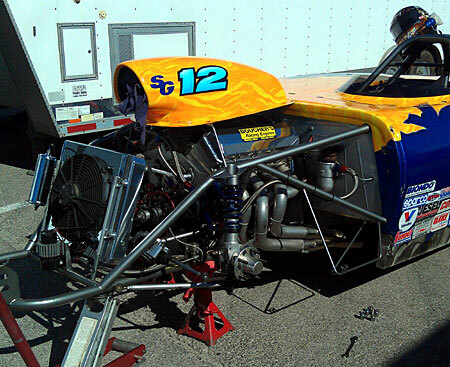 Special thanks to our supporters who help make our racing possible, including Sawyer Automotive in Acton, MA, Auto Meter Products, Select Performance, Hoosier Tire Mid-Atlantic and Boucher's Racing Engines.